Please ensure all Magazine Fees and Affiliation Fees are PAID in full to ensure you feature. 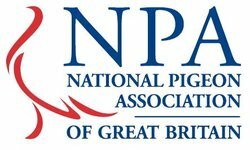 Aberdeen & District Show Pigeon Society - NPA affiliated club promoting all breeders of show pigeons Annual show held 2nd weekend in November Subscription adults £5.00 partnership £7.00 under 16 £1.00 All enquiries welcome contact secretary Henry Lornie, 115 Gardner Crescent, Kincorth, Aberdeen AB12 5TP Tel 01224 874532 or 07483212835 Email: lornie@btinternet.com. Anglo Iberian Cropper Club & Marchenero Cropper Club - Able performers that’s our Spanish breeds, in the show pen or in the air they are talented and a joy to watch 24/7. Our Club has promoted these beautiful breeds since 1985. For more information contact Jim Mullan, NPA Master Breeder and International Judge on Tel: 07713 359386 or Email: james@wishingwelldoves.co.uk and start your Spanish love affair with the Don Juan of the sky. The British King Club - welcomes new members. President: Mr Francis Bradbourn. Treasurer: Mr Gary Eaton, 13 Carisbrooke Drive, Corringham, Essex. SS17 7PL. Secretary: Mrs Sheila Goodman Tel: 01908 643367, Email: kenorsheila367@yahoo.co.uk Subscription: Single £3, Partnerships £5 per year. British Nun Club - Secretary: R S Henderson, 98 Langton Road, Norton, Malton, N. Yorkshire, YO17 9AE. Tel: 01653 697997. Email: richardsnuns@aol.com Subs £10 Adult, £1 Junior members. Key Rings £2, Enamelled Badges £5, Cloth Patches £5. Newsletters to all members. New Members welcome. www.freewebs.com/nunclub, www.nunpigeons.com, www.showpigeons.co.uk. High Wycombe Fancy Pigeon Society - Catering for all breeds of Fancy and Flying Pigeons. Subs £3 per year. Contact: R D White, 20 New Road, Bolter End, High Wycombe, Bucks, HP14 3NA. Tel: 01494 882582. The Midland Columbarian Society - Meetings held at Towcester Rugby Football Club, Greens Norton Road, Towcester, Northamptonshire, on the first Tuesday of every month, except January and February. New members welcome, annual subscription £5 for details contact Temp Sec/Treas: Ken Goodman MBE, 47 Drayton Rd, Newton Longville, Milton Keynes, MK17 0BH. Tel: 01908 643367, Email: kenorsheila367@yahoo.co.uk. National Horseman Pouter Club – President: J Dolier, Chairman: G Coffey Tel: 0794 170972, Secretary: G. Jennings Tel: 07963 686947. Catering for Show and Flying Horseman. Membership £6 per year. Old German Owl Club - This NPA affiliated club has been set up to cater for this very popular breed. New members very welcome. Subs Adult £5, partnerships £7 and juveniles £2. Please contact secretary Mr Ashleigh Emerson. Tel: 07783 688274. Email: Ogoc@hotmail.co.uk. Facebook: Old German Owl Club UK. Reading Fancy Pigeon Club - Catering for all breeds of fancy and flying pigeons. Shows in March, July, November and a Championship Show in January. New members welcome. Subs £5 single and £1 Juvenile. Secretary / Treasurer: John Glew, Honeysuckle Cottage, Tilehurst Lane, Binfield, Berks, RG42 5JR, Tel: 01344 483014 before 9pm please. Southern Counties Show Racer & Flying Breeds Society - Five Club shows, one Open Championship show. Membership £5 per year. Contact Dave Savage, 65 St James Avenue, Ramsgate, Kent, CT12 6DT. Tel: 01843 589465. The United Fancy Homer Club - President Andrew Emerson, Chairman Mark Rudd. Catering for breeders of British Antwerp’s, Exhibition, Genuine, German Beauty and Show Homers. “Quite Challenging…But well worth the effort”. Annual subscription £5 per loft. Secretary and Treasurer Mike Bradford, 3 Burnham Drive, Whetstone, Leicester. LE8 6HY. Tel: 0116 2849653.